*These are the other Christmas cards I made last week. The first card is one of my favorites lately, it has some of my favorite soft colors and embellies... papers from My Mind's eye and Melissa Frances a chipboard star covered with yummy soft pink glitter from the craft store , stamps from Heidi Grace and tag from Creative cafe and the one that says "antique" is from a digital kit from shabby Jen. Estas son las demas tarjetas de Navidad que hice la semana pasada. 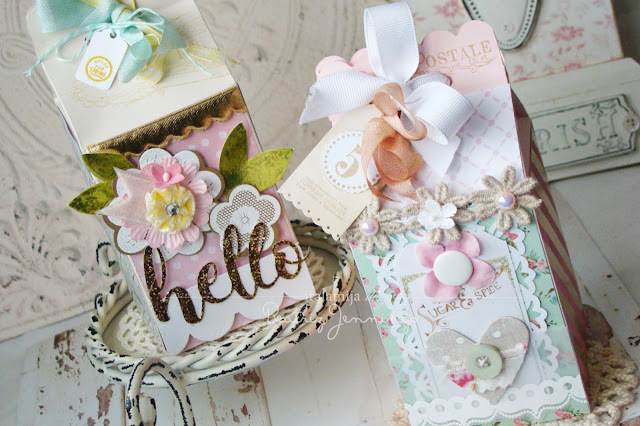 La primer tarjeta es una de mis favoritas tiene mis colores preferidos y tambien muchos adornos que me encantan... papeles de My Mind's eye y Melissa Frances, estrella de chipboard cubierta con un bello glitter color rosa palido que encontre en la tienda de manualidades, sellos de Heidi Grace y tags de Creative cafe y la que dice "antique" es de un kit digital de shabby miss Jen. Next a couple of sweet cards made with Basic Grey paper and some leftovers of chipboard, stickers from Making memories, Melissa Frances, rub ons from Crate paper, some embossing, jewels, buttons, ribbon etc... Before I go I will answer one question from the yesterday comments: Mary said... Hello Bety, I can't get enough of your Christmas card creations. More.. More..More..show more. I love the last one with the pink ribbon and that lace is gorgeous. I love the first one that says: It's beginning to look alot like Christmas. I would like to know how you did the words. Did you stamp them or was it printed paper? Thanks for taking the time to share your ideas with us. Ohh, these are all really pretty! I love all the sweet details and glittery fun that you put into these! Your cards are so warm! I love your ribbon bows! Beautiful! And all those elements you incorporate into your cards is just simply amazing! Just stopping by to say hi! Hi Bety! All gorgeous cards. . . again! :-) Makes me want to go create something pretty too! Can I ask a question though? 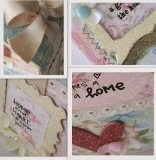 When you stitch on a card, do you stitch directly on the card base and let the stitching show on the inside of the card or do you stitch on the paper and then adhere it to your card base? If you do the latter, what adhesive do you recommend? I just can't find one that holds the stitching down well! Thanks so much for your help!! Son preciosas! tan delicadas y bonitas! me encantan! los lazos son increíbles! un saludo desde España. These cards are beautiful! Love all of the glitter! Beautiful cards!!! I love them!! These are absolutely stunning, Bety! Gorgeous Christmas cards, Bety! I love each and every one that you've created! I simply love your style (and will continue to drool as I look at them all! LOL!). Just gorgeous, love the detials! These are just soooooo beautiful!! !